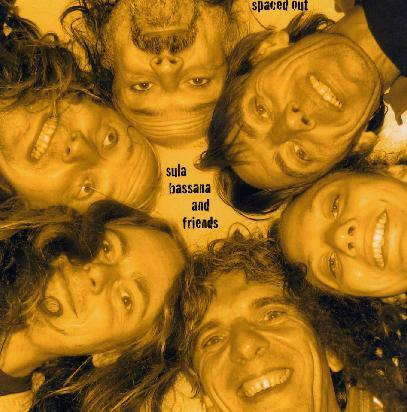 Sula Bassana and Friends - "Spaced Out"
This is a pretty cool double CD-R limited to 100 copies that was recorded live from the soundboard very late at night from the FreakWEEKnoEnd Festival on August 17th, 2006. 6 pieces of music featuring synthesizer, djembe, two guitars with loads of effects and delay, drum machine, some vocals and jews harp. CD ones starts with the 20 minute Echoflow, which is a very slow building spaced out drone with cool delay guitars before the drum machine begins and some really nice flute as well. the 18 minute Spaced… Peacenopeace is next and begins with spacey synths and guitars before the drum machine comes in and again some nice flute. The band freaks out a bit more at the end. Still these first two tracks are pretty tripped out ambient psychedelia. Strange Forest is the shortest track at 12½ minutes. This track features two djembe players and the way the guitar is played reminds me very much of CAN. Very tribal and tripped. Pollenflug Jam runs 23 minutes and ends the first CD. Again, we have the drum machine but also the djembe players to keep the groove more uptempo with one guitar playing a very stoned CAN like riff and the other really spacey guitar. Throw in some flute, synth sounds and strange chanting and you have for a really stoned time. On to CD 2: It begins with Oh Schön. This track has the drum machine and a quite repetitive guitar riff. The vocal chanting comes in as the synths get more and more intense and the spaced out guitar kicks in as well. I am sure the people in the tent were tripping. The CD ends with the quite far out 43 minute Floating Circle! This track features the flute again and is a more smooth psychedelic journey. Must have been a cool show. Remember, 13€ and only 100 copies, order your trip now! For more information you can visit the Sulatron Records web site at: http://www.sulatron.com.